Where was this Off License? 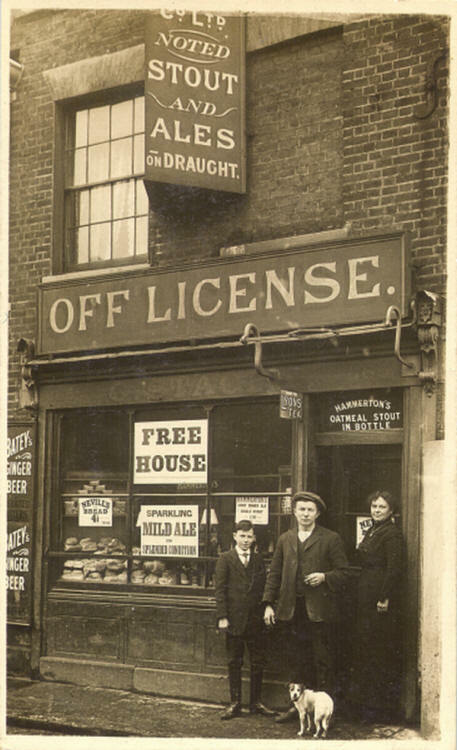 This old photo shows an OFF LICENSE situated somewhere in Church Street, Deptford. Any clues as to where it was located. There was a boot menders, then some more houses, after that there was the off license. This information was given to me by my mother Sophie. Thanks for that info was it just before the Oxford Arms/Birds Nest on the same side or on the opposite side? The off license was indeed at 165 Church Street, on the west side, at the north end, next to a Unitarian Baptist Church, about thirty yards from Creek Road (therefore the opposite end and opposite side to the Oxford Arms/Crows Nest). According to the 1914 Post Office directory it was owned by Charles Stacey, beer retailer. Pre 1965 Photo of the Oxford Arms Church Street. V2 DAMAGE BRATAVIA STREET, DEPTFORD.